NATICK – Massachusetts Transportation Secretary and CEO Stephanie Pollack today, Sept. 13, joined Secretary of Energy and Environmental Affairs Matthew Beaton, Acting Highway Administrator Jonathan Gulliver, and MassDOT and EEA staff on a tour to look at a recently activated electric vehicle charging station at the Natick Service Plaza along I-90 (the Massachusetts Turnpike). In addition to the charging station in Natick, MassDOT is in the process of installing five other electric vehicle charging stations at locations along I-90 in order to enable long-distance electric vehicle travel, increase range confidence, and support electric vehicle adoption throughout the Commonwealth. 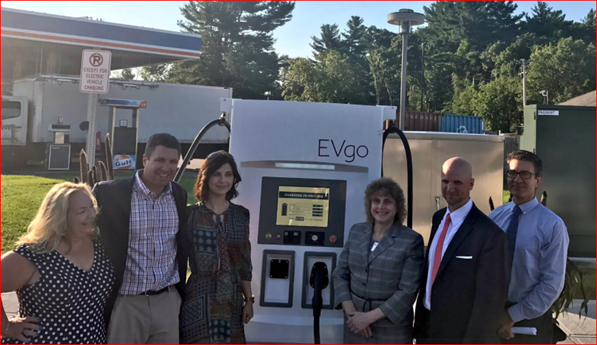 Charging stations are now operational at the Natick and two Lee Service Plazas, with a station at the Framingham Service Plaza scheduled to be activated this month, and stations at the two Charlton Service Plazas expected to be activated this fall. At this time there is no fee to use a charging station. These charging stations support electric vehicle travel along I-90, which is one of several major Massachusetts highways designated by the federal government as part of a national network of EV charging corridors. MassDOT and the MBTA will be celebrating Climate Week this week and next week in order to highlight state efforts in climate resiliency and climate adaptation, and celebrate the one year anniversary of Governor Baker’s signing of Executive Order 569. The Order, which builds on the administration’s nation-leading efforts to reduce emissions, lays out a comprehensive approach to further mitigate greenhouse gas emissions, safeguard residents, municipalities and businesses from the impacts of climate change, and build a more resilient Commonwealth. MassDOT is currently undertaking several climate focused initiatives including conducting a Statewide Vulnerability Assessment, a Coastal Transportation Vulnerability Assessment, and developing comprehensive plans for bicycle as well as pedestrian transportation. MassDOT is also continuing to install solar energy infrastructure at its Research and Materials Lab in Hopkinton and throughout its transportation systems and will be constructing its new Highway District 3 Office in Worcester as a Zero Net Energy facility.